Ocean View and woodfire. One bedroom cottage - BLUEGUM - Ideal for couples to relax, unwind, and enjoy beautiful views across our 280 acre farm to the ocean which enhances a peaceful & private setting. Fully self contained & fully equipped for comfort & privacy. It really is the perfect location to base yourself if you’re wanting to explore the coast and forests of South West Victoria. Shower recess, vanity and toilet, heated towel rack. 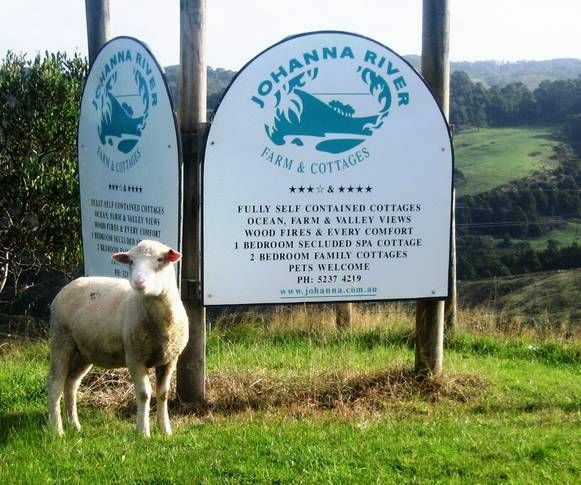 Johanna River Farm & Cottages is located at the foot of the Otway Ranges just off the Great Ocean Road ~ midway between Apollo Bay & the 12 Apostles. It is central to all the highlights of the Great Ocean Road & the Great Otway National Park. Johanna Beach, a step on & step off point for the Great Ocean Walk, is just 4 kms down the road. Our 280 acre working farm & four fully self contained cottages offer the perfect location to base yourself if you're wanting to explore the coast & forests of this region. If you're looking for genuine farm stay accommodation on the Great Ocean Road then this will not disappoint. Holidaying with kids is ideal as our two bedroom cottages are well equipped & there is lots to do in the region. Each cottage has beautiful ocean, valley & farmland views, are fully self contained & fully equipped. Our one bedroom cottages provide couples with a picturesque, peaceful escape, with all the comforts, & a truly secluded location. Group Accommodation Great Ocean Road : Travelling in a large group? Our cottages are popular with larger social or family groups who holiday together. Enjoy the large common lawn & garden area which encircles 3 of the cottages as well as enjoying the comforts & extra amenities when booking multiple cottages. We are ‘pet friendly’ so the family pet is very welcome! The Great Ocean Walk extends along the coastline & Johanna Beach is the midway point where you can step on & off the walk ~making Johanna River Farm & Cottages an ideal central accommodation base to complete the whole walk or spend a couple of nights respite from camping. Self cater in our fully equipped cottages ~ eat out at nearby cafes & restaurants ~ or speak with us to arrange ‘in house’ catering – where meals and provisions can be delivered to your cottage. Johanna River Farm & Cottages are official partners in Parks Victoria Great Ocean Walk Program.